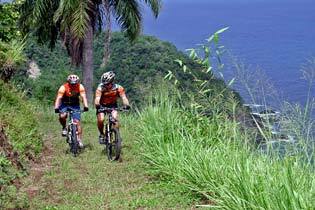 Tobago Mountain Biking Tours, rides from cool to pure adrenaline! 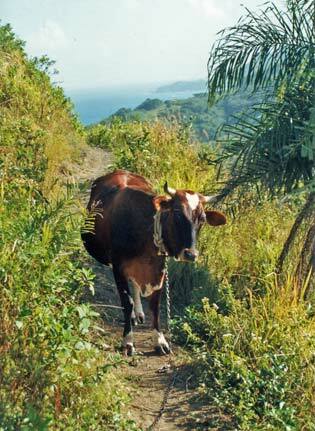 Summit-to-sea-level runs on sheer trails, down hill through dense jungle to land on deserted beaches. Describing Tobago mountain biking as "island biking" terrain doesn’t do to it justice! Tobago offers a wide range of trails from breathtaking downhill for experts, challenging single tracks, for intermediate, to easy-coast cruises for beginners. 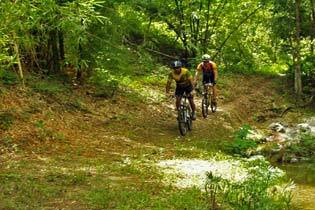 It is a first class destination for mountain bikers of all levels. Do not try to understand the names of the trails given by local mountain bikers, you’ll have to ride them to make any sense of "Coke Kills", "Indian Walk", "Gru-Gru Boeuf", "Wild Cow Trace", "Sky Loops" and "Chocolate Cake". 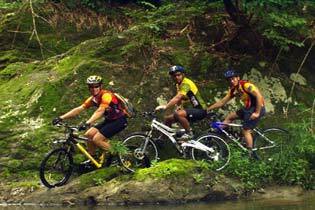 Each tour is decided based on your mountain biking skills. We usually pick you up at your hotel, to drive to the area where the tour will develop (transfer time depends on where we decide to go). We’ll start with safety instructions and if you are a beginner some riding tips won’t hurt. Now we are ready to ride and sweat! Wherever we decide to take you it will be for your total enjoyment! Included: Drinks, Bike, helmet, SPD pedals upon request.